Somehow, Killiney reminds me of Kilkenny. LOL. Anyway, I 1st heard about Killiney back in my college days where I had to rely on my friends trusty bike. Those days, there were just one Killiney which is at Uptown, Damansara Utama. So, imagine to my amazement when I heard that they've already had 10 outlets at the point of this post! The most recent outlet that's opened is located in the newly build mall of SS2 aptly named SS2 Mall. 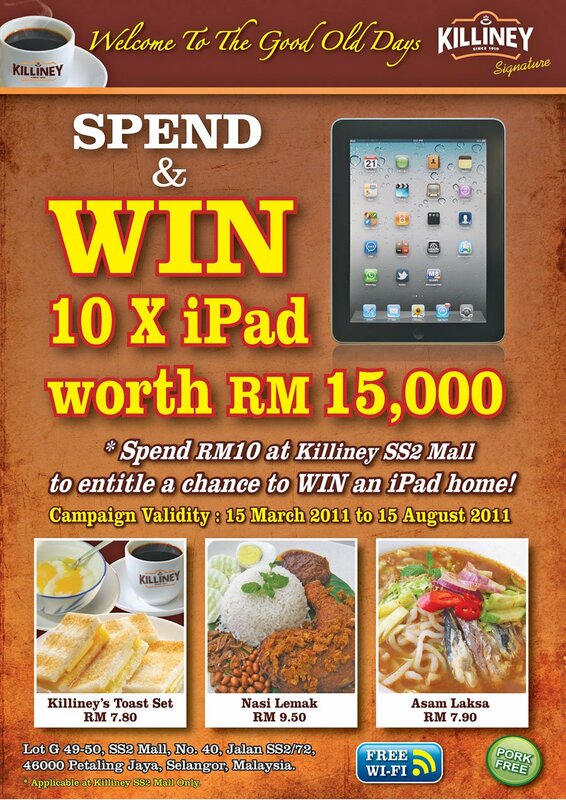 To encourage diners to visit this new outlet, Killiney Signature at SS2 is having a lucky draw contest where diners stand a chance to win an iPad. All you gotta do, is dine in at Killiney Signature in SS2, spend a minimum of RM10 in a single receipt and that's it. Fill in your details in the form you're given, drop it into the box and you're on your way to win an iPad. The lucky draw is held every week and the last one will be on August 15, 2011. So if you're around the place and feel like eating something, how about dropping by at Killiney Signature in SS2. You never know, you might be taking home an iPad from them one day. haha. Remember, only available at Killiney Signature SS2 branch. No slogan, no drawing and no quiz just simply eat and drop the form? That's cool! Can fill one's tummy with min RM10 and in exchange for an iPad. Shall go for it if Bananaz is around that area. tQ for sharing. Yup, just eat and stand a chance to win because it's a lucky draw contest. Of course chances of getting depends on the amount of people eating there for the week and the number of times you went there to eat for the week.